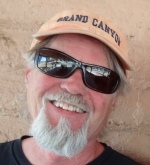 In Sputtering Canyons, Part 1, we discussed Arches National Monument and evidence that it was formed by a complex sputtering discharge process. 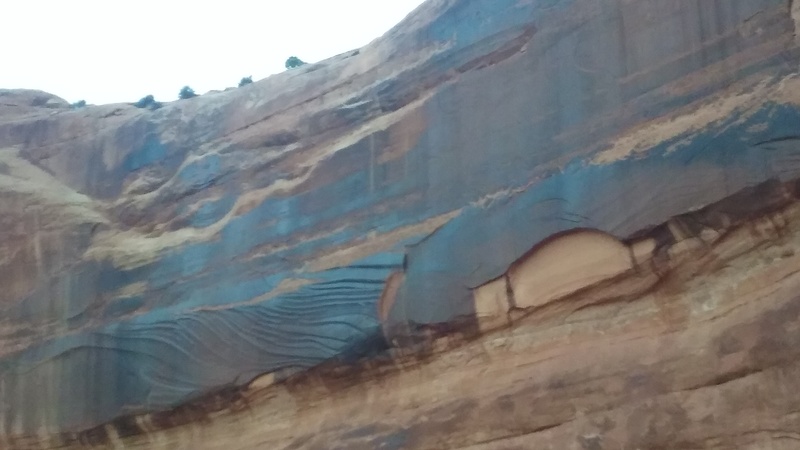 That process involved a thermal spiking, barrier discharge in a layer of wet sandstone. 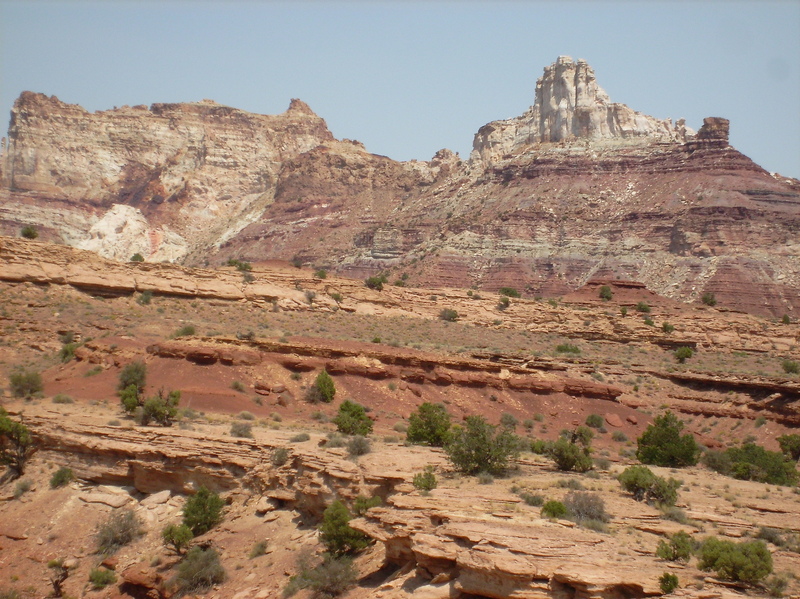 In Part 2, we’ll take a broader look at some regions on the Colorado Plateau where similar sputtering discharge processes took place. 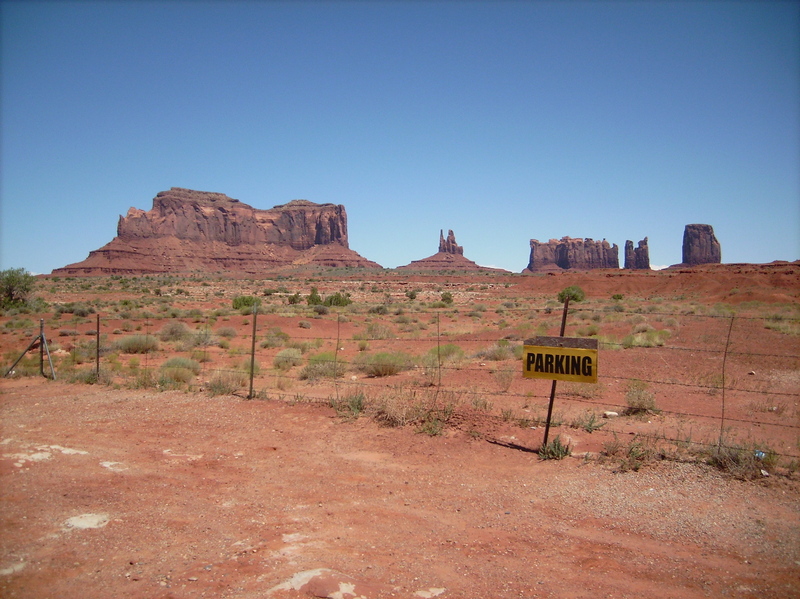 One of these is Monument Valley. 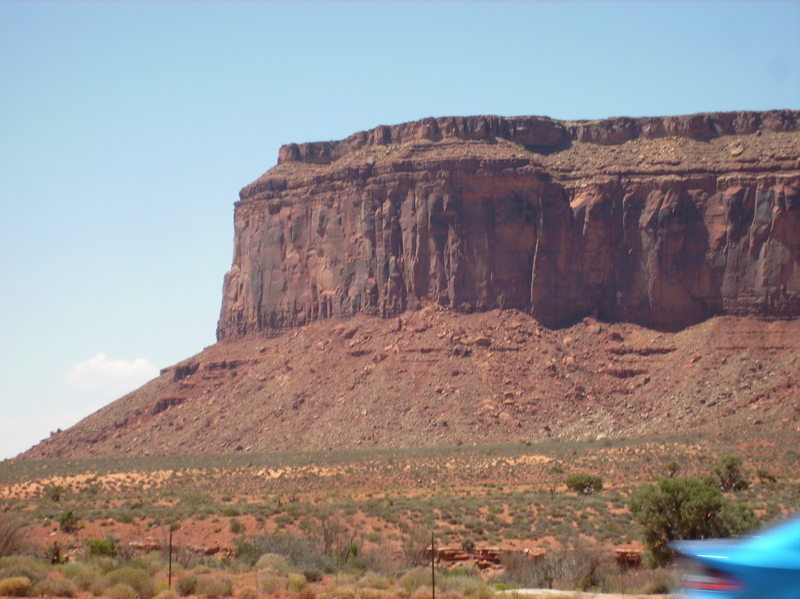 Monument Valley was formed by sputtering discharge that almost completely etched a layer of the original dome away. 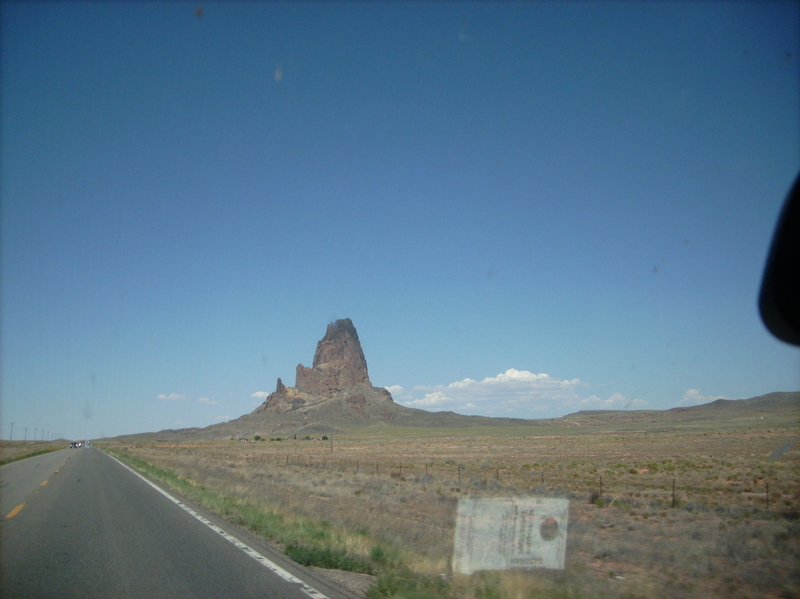 What is left are the lonely pinnacles and buttes iconic to Western movies. 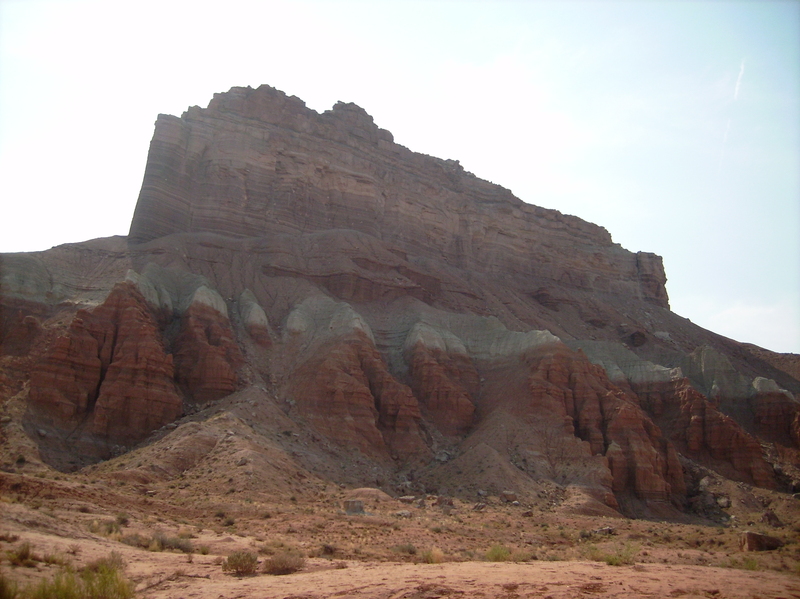 The reason these pinnacles and buttes are left standing, while the same layers of sandstone etched away around them, is due to preferential sputtering. Preferential sputtering is normally associated with sputtering an alloyed metal where one element in the alloy sputters more efficiently, eroding away faster than the other alloy metal. 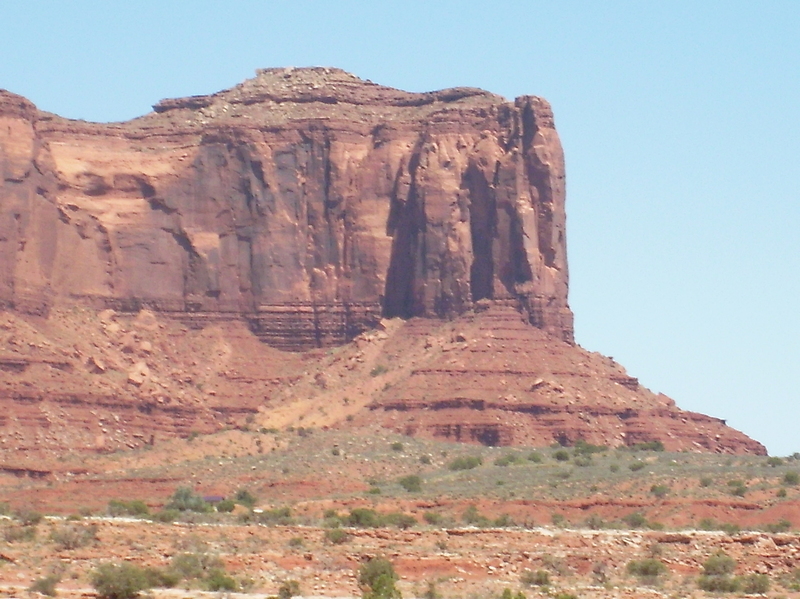 In Monument Valley, the buttes and pinnacles left standing were portions of the dome that resisted sputtering because of a difference in charge density. The part of the dome that lifted away, did so when the wet layer — the icing in the layer cake — became a charged, hot ionized mud. A sheet of high charge density developed at the base of the mud with an attraction to the clouds above — and like an electromagnet picks up a junk car — the storm’s electric field lifted away the overburden to dissolve in electric winds. 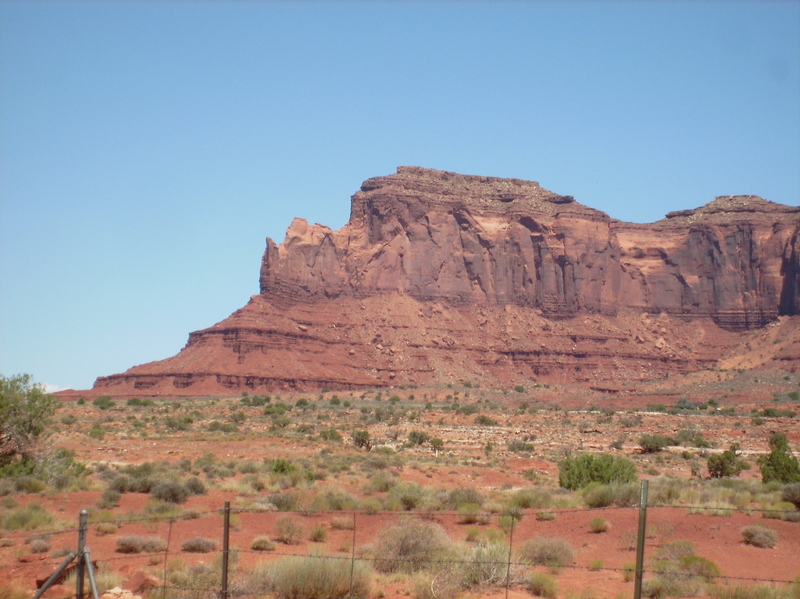 The buttes and pinnacles are remnants that didn’t have the same charge in their wet layer, so they didn’t get pulled away by the electric field. The reason is: they were struck by lightning. In the dark mode, drifting plasma current that causes sputtering, there is always the potential to spark. Manufacturers are careful to avoid this because it will flaw the finished surface. 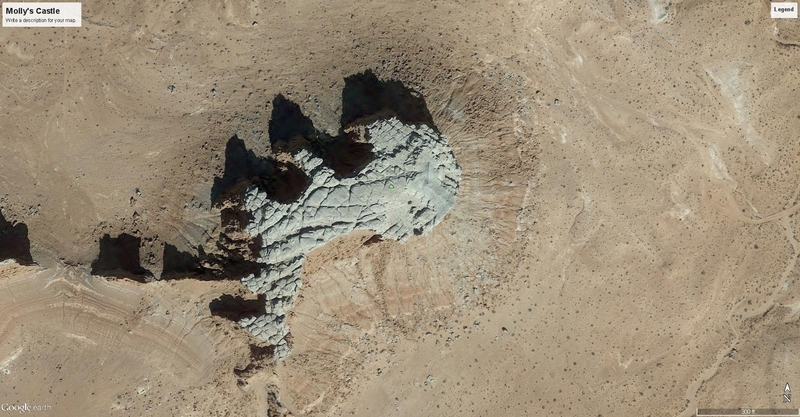 The pinnacles and buttes were parts of the dome where an arc or many arcs struck and dissipated built-up charge. Instead, it altered the ground charge beneath the strike zone so the electric field couldn’t pull it away. Therefore, the buttes and pinnacles were preferential — not sputtered. In the parlance of the semiconductor industry, the charged layer was doped by the presence of water and minerals, which gave it an excess of electrons. 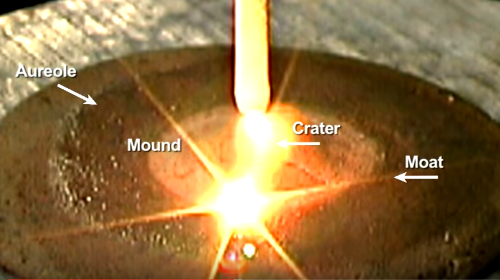 When lightning struck, it depleted the charge and left an excess of “holes,” or the absence of electrons, which canceled the attractive force of the sputtering discharge. The evidence for this is manifold. 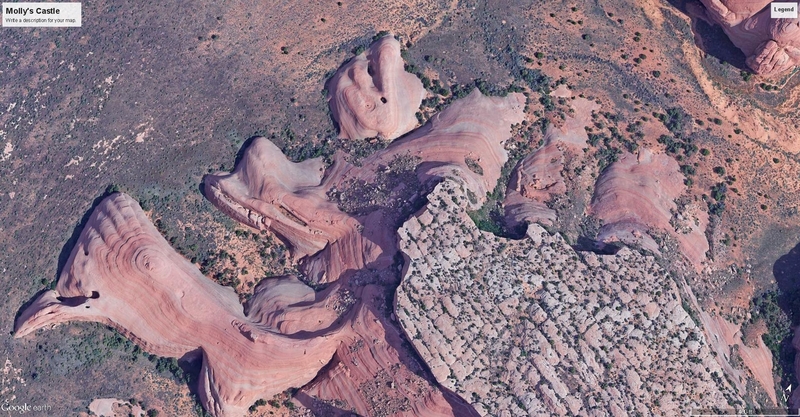 To begin, consider the cap rock formations and spires found on buttes. Butte tops aren’t flat. They generally have something like a step pyramid, dome, or pinnacle on top, which is where the lightning discharge was most intense. 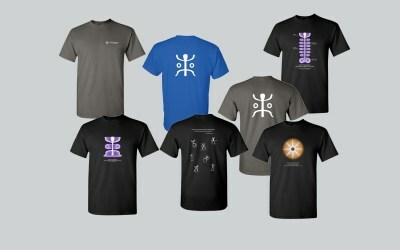 Notice, in the images below, the pyramidal caps. The rock below the caps is darkened significantly more than adjacent stone. 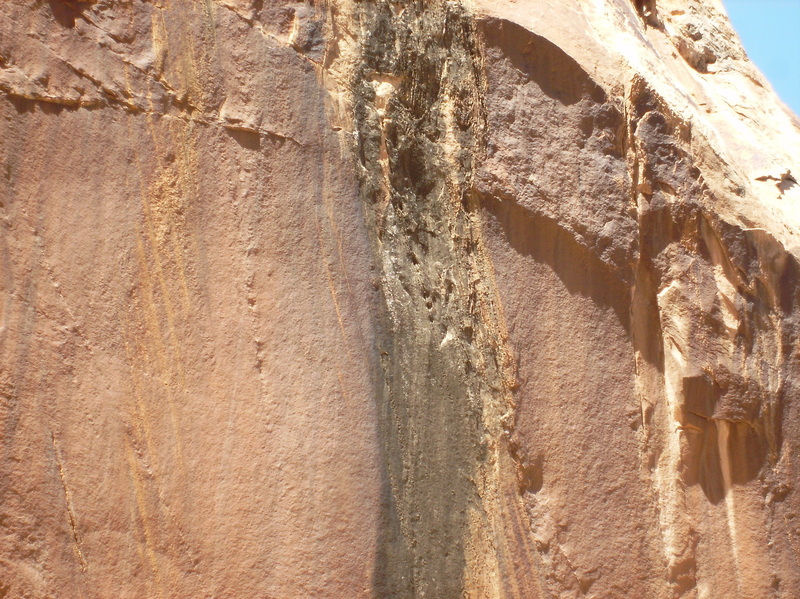 Not only is there black patina, but there is also more redness to the rock itself in streaks below the caps, with deep vertical fracturing. The charge depletion from lightning, and the subsequent recombination of the most severely depleted zones beneath where it struck, heated, shocked and hardened the rock more in these areas than in others. 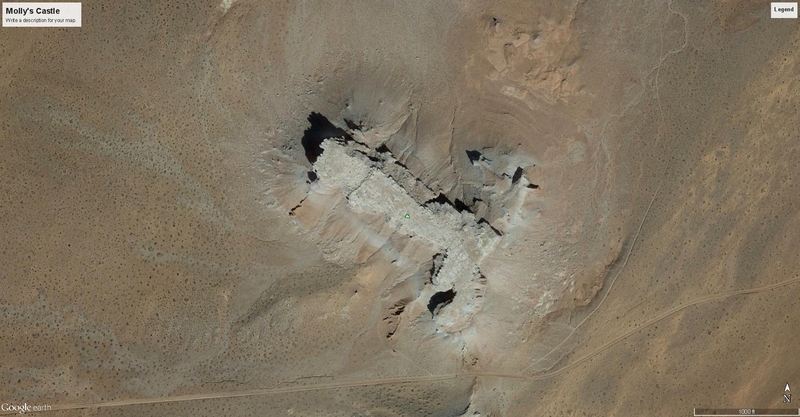 The step pyramid structure or terracing on canyon walls and buttes is another evidence of sputtering. 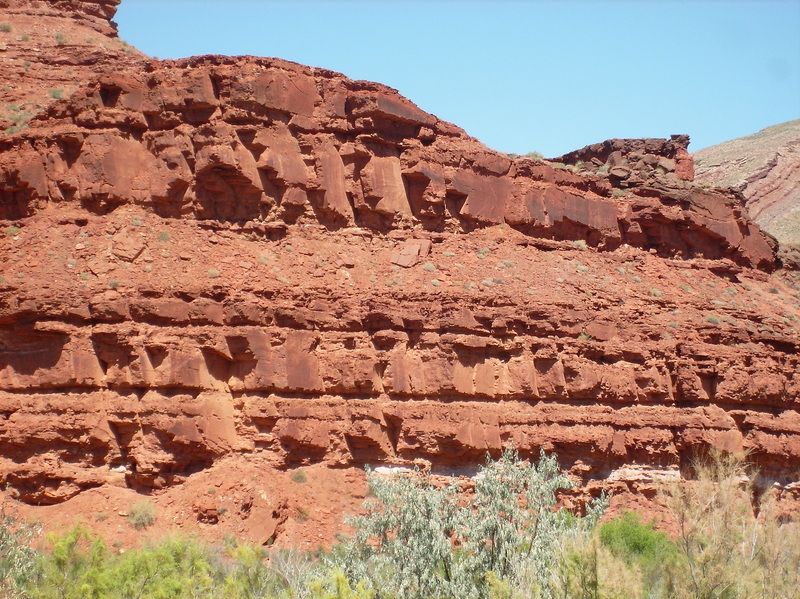 Each sedimentary layer has different compositions of minerals and moisture, differentiating the dielectric property of each layer. 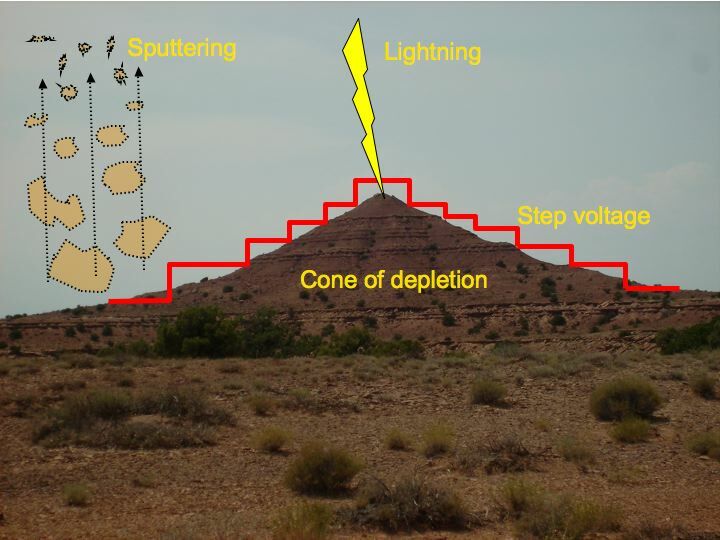 The zone of charge depletion under lightning strikes spreads out in a conical diffusion pattern, but the cone is stepped or terraced because there is a step voltage across each dielectric layer. 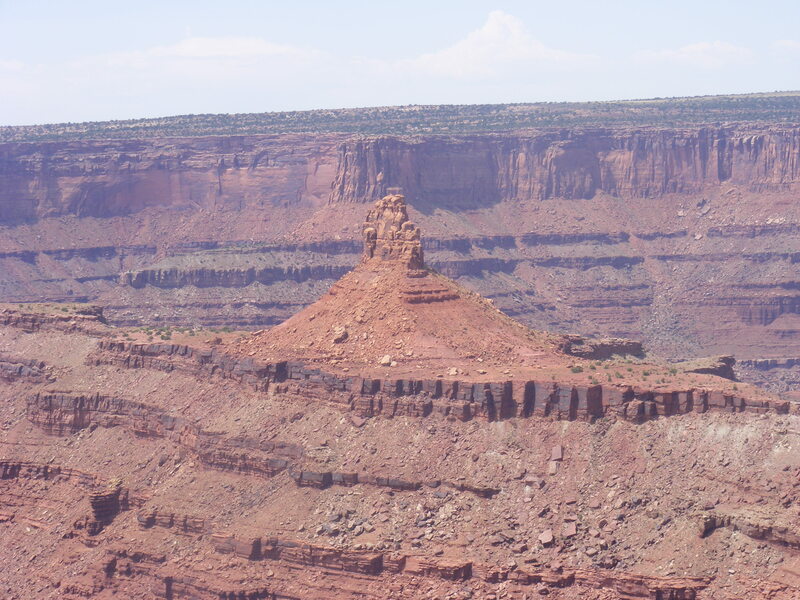 Where there are towering cliffs with sheer vertical walls, it is because it is a monolithic layer with a consistent dielectric, causing a single large voltage step. Where there is very hard rock, the edges are torn in chunky blocks. 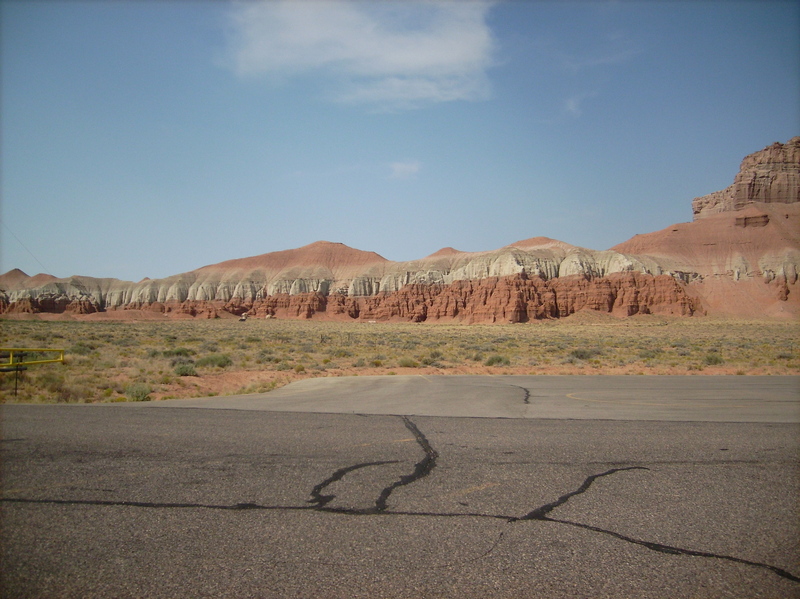 The flat, smooth breaks are not the result of millions of years of erosion of any type — wind, rain, ice, exfoliation, or flowing water. Any of those actions would have the opposite effect. The rocks have such smooth, flat faces, and sharp, angular, undercut edges because they were broken by mechanical shearing as the neighboring rock was ripped away. Evidence of shearing is especially evident on monolithic walls. 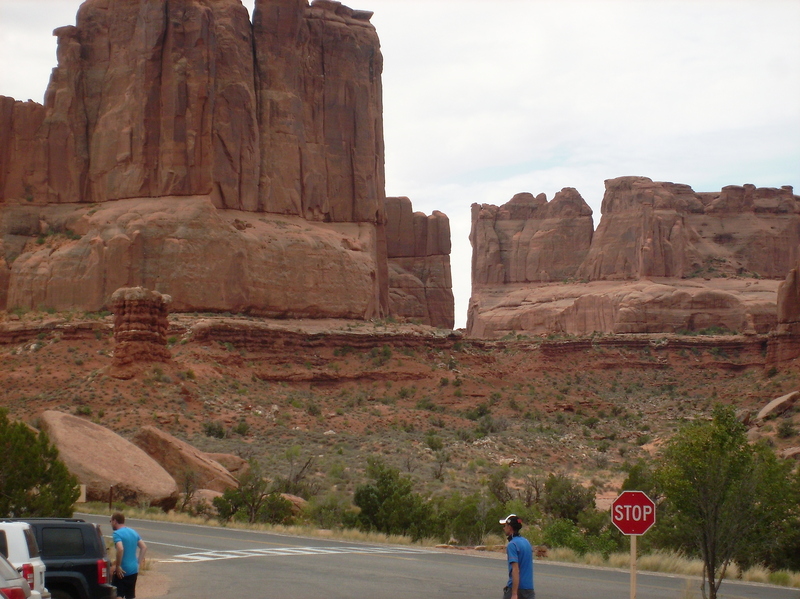 Sharp-edged breaks are everywhere, leaving smooth, flat faces, hardly roughened, or rounded by any act of erosion. Arching fissures are evidence of spalling, where the material tore away in flakes, cupped upward in the direction of shear. 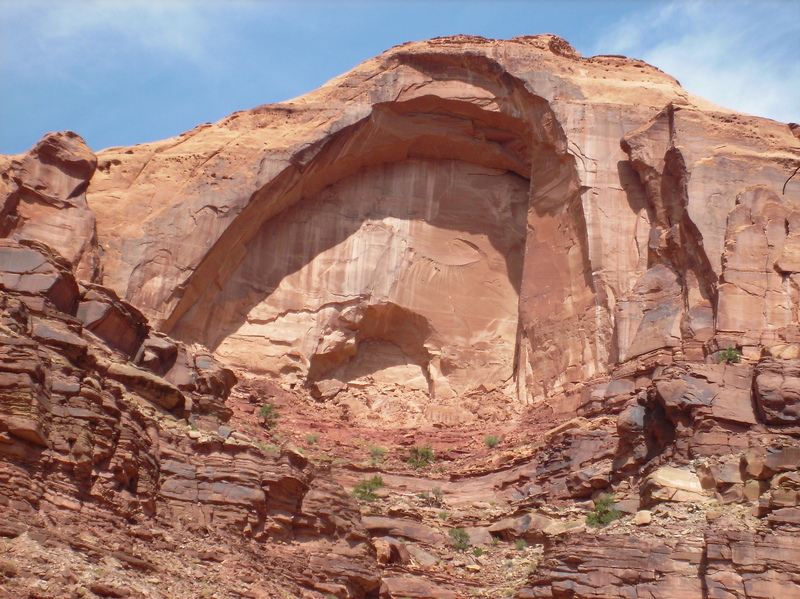 The arches often show concentric creases where flakes broke away in smaller sections deeper into the rock. One can see the same type of concentric flaking in broken glass. 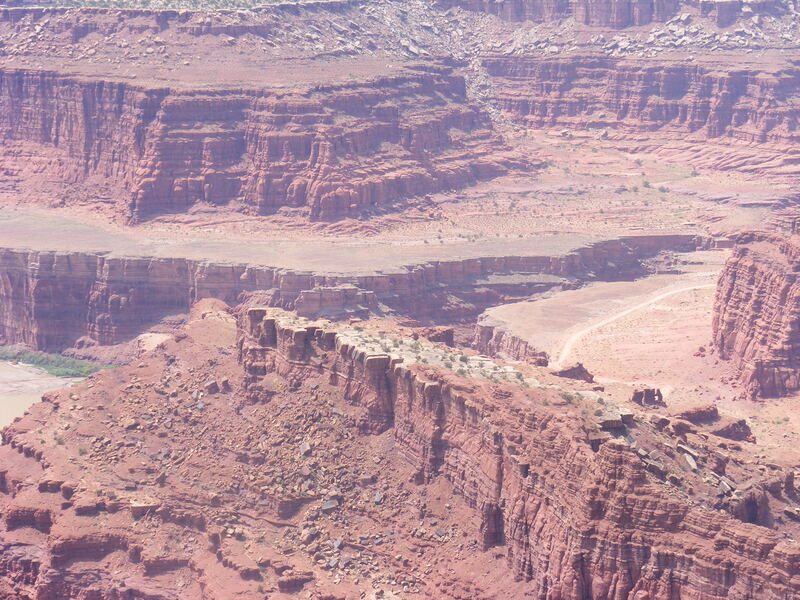 In some places, the canyon walls have the look of broken glass. In others, it looks more like the broken end of a brick of hard cheese. Perhaps a well-aged Parmesan — stiff, dry and flaky, with a low shear strength. Upward cupping flakes leave spall marks from shear. Cupping spalls where rock flaked during shear. Cupped spallation with effluvia spilled from a fissure. Big cupping spall inside a spall. Besides cupping spalls, some surfaces show other evidence of stress fracturing due to shearing force. 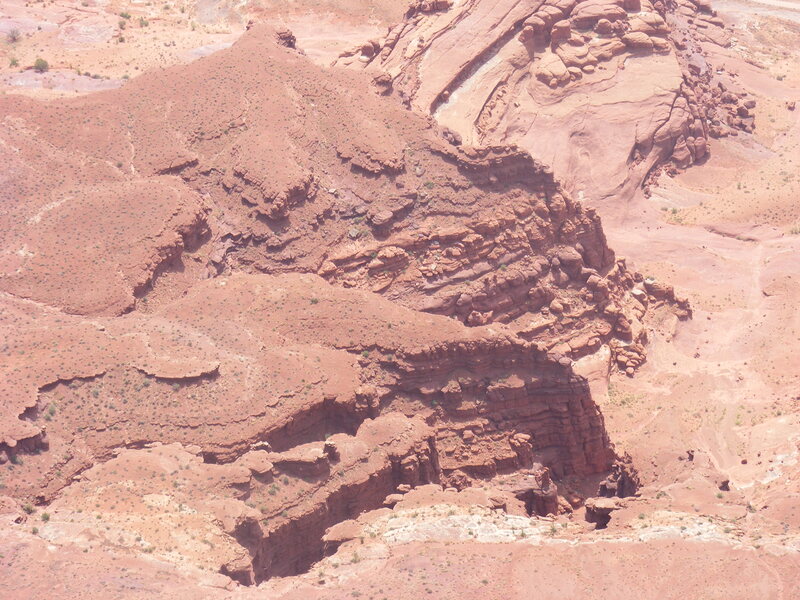 Stress fractures create sharp-edged, wavy spalls where the rock was torqued as it sheared away. 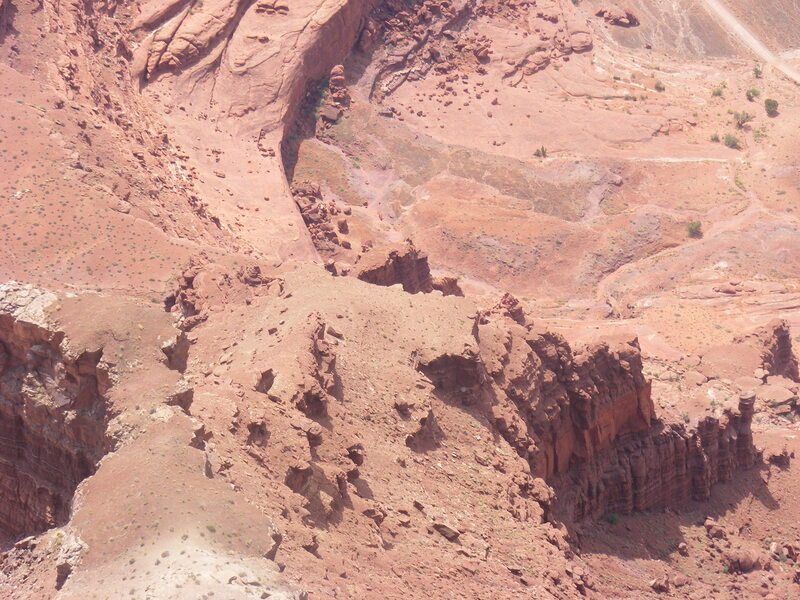 There is almost always a thin layer of hardened rock at the interface of each terrace. 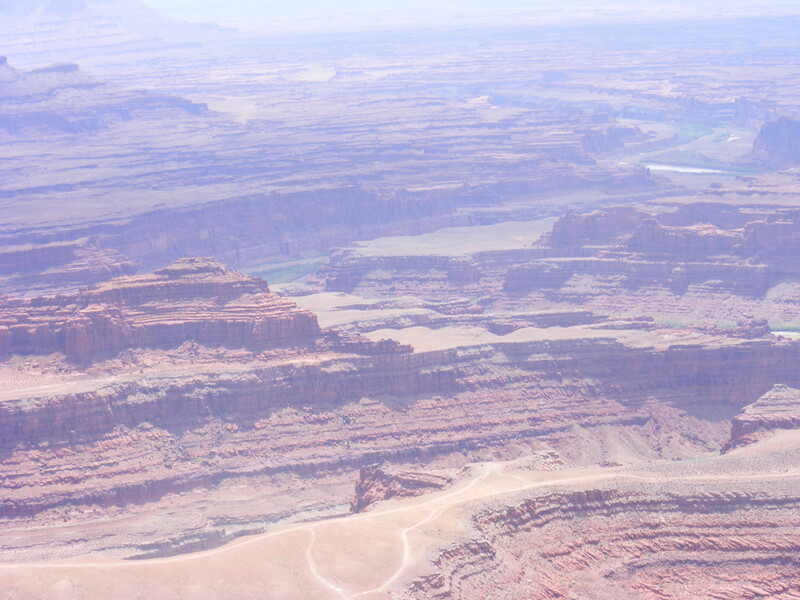 This is where charge accumulated at the boundary layer of the strata, and the current hardened the charged sheet of rock more so than the surroundings. Each dielectric layer spreads charge to the interface of its layer, driven by the electric field, to balance the voltage drop across the layer. So a charged sheet develops at the interface of each layer, and a step voltage to the next layer, which creates a surface tension at the interface, which makes the rock hard and dense. What is sandwiched between is often loosely consolidated. Pinnacles in this region are of two types. Fulgurites, like the burnt shard of Agathla peak, are the direct result of lightning boiling up the crust of the earth in an electromagnetic blister. 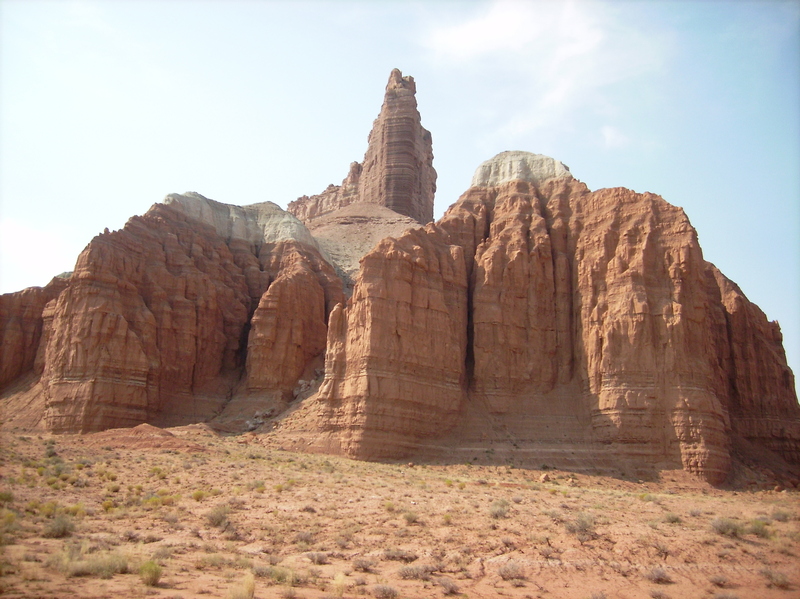 These types of pinnacles were discussed in Lightning-Scarred Earth, Parts 1 and 2. 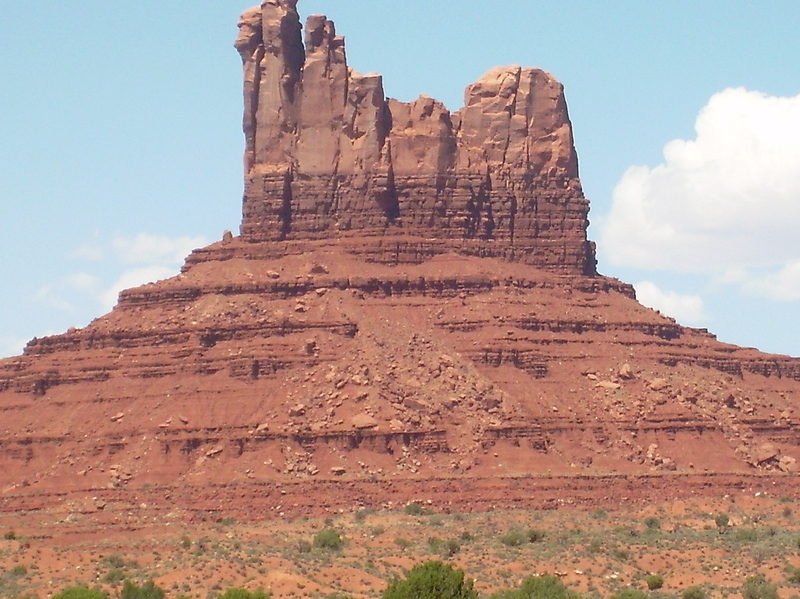 Agathla Peak in Monument Valley is a lightning blister. 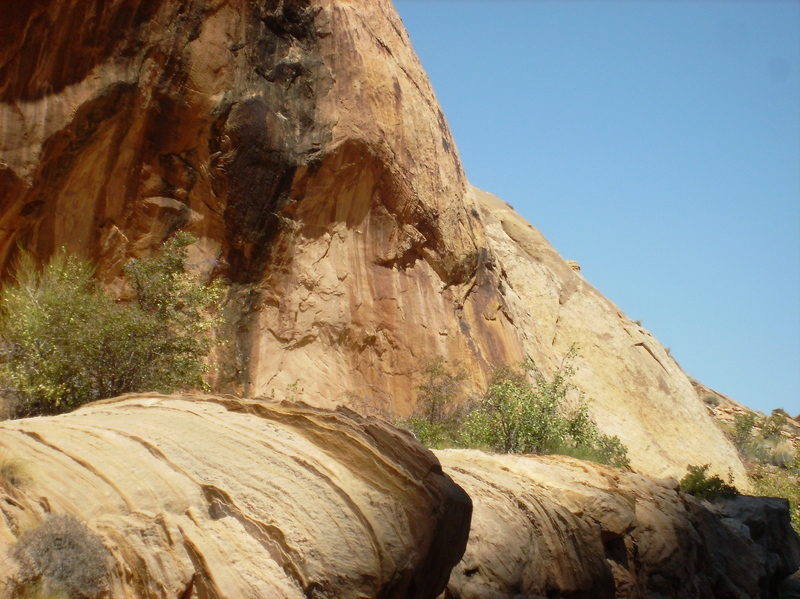 Sandstone pinnacles are where lightning struck and altered the charge in the rock beneath it, creating an electrical ‘shadow’ to sputtering discharge. They are literally the shadow of lightning strikes. The footprint of a ‘brief’ strike, comparatively speaking, produces a narrow cone of protection. How the cone slopes and steps depend on properties of the rock layers and the electric field potential. 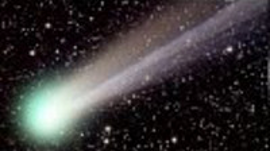 More sustained, or potent striking begins to diffuse charge depletion outward, forming nodes, or star-like breakouts. Still larger accumulation of strikes diffuses charge further, and nodules break out into ‘wings’, or dikes of charge depleted rock. The shadow footprint grows as arcing continues, elongating charge depleted zones into wedges with dikes growing out the tips and edges. It’s actually the beginning of a fractal dendrite, as lightning bombardment soaks charge from the ground, diffusing outward in branches and creating a depleted zone protected from sputtering. If the process continued before the surroundings sputtered away, the dendrite nodules would grow and branch in ever smaller fractal repetitions, like branches of a tree. 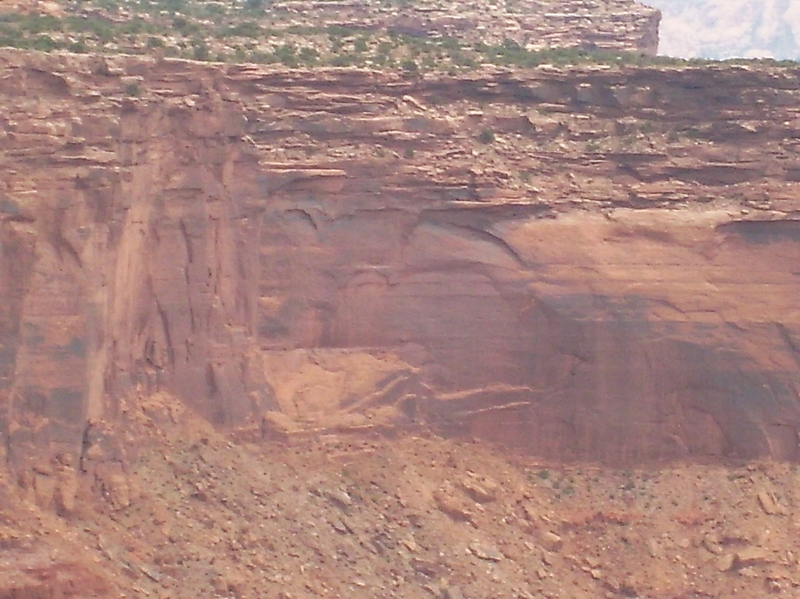 As adjacent rock is struck, the depleted zones connect into networks of wedges, ridges, and pinnacles. 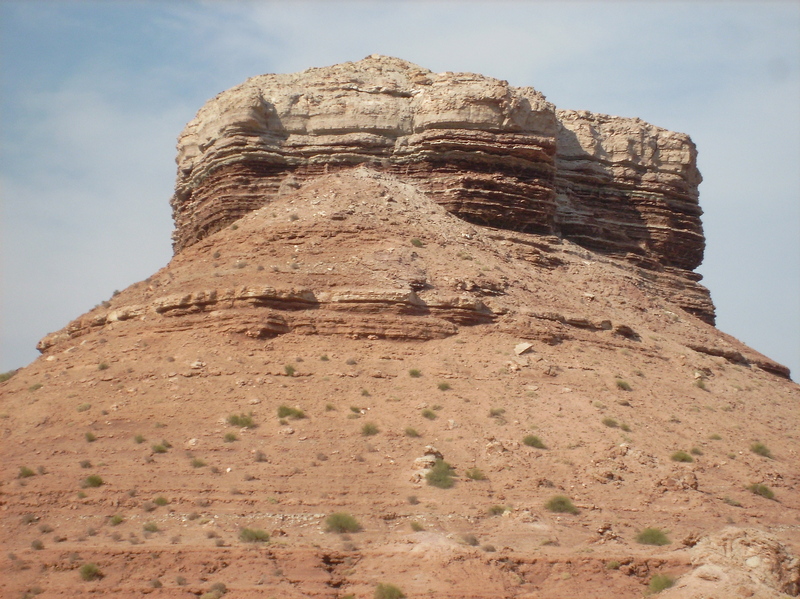 Generally, the pinnacles and buttes left on a dome are layered flat, but in some areas buttes display a dip, indicating horizontal winds influenced the deposition. Sputtering follows the voltage gradient, and so carves away from the lightning depleted zone in alignment with the strata because the voltage gradient follows the dielectric layers, cutting at 90º to the dip angle, leaving a straight-edged, non-vertical wall. 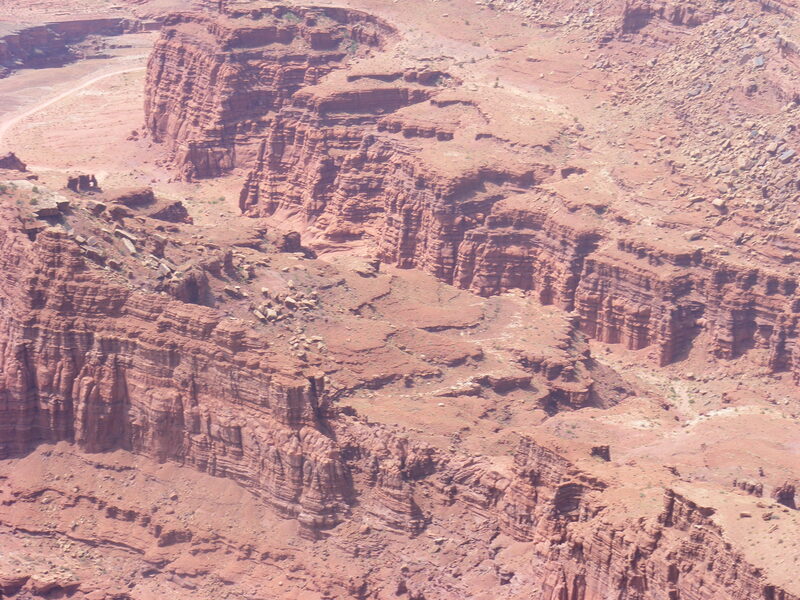 If eroded by conventional notions of wind, rain and mass wasting, the rock would obey gravity and erode a vertical wall. 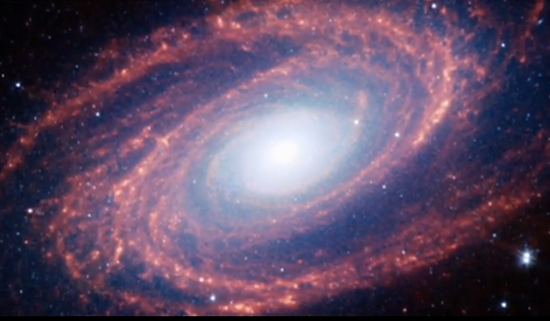 It is in details like this that prove electrical formation. 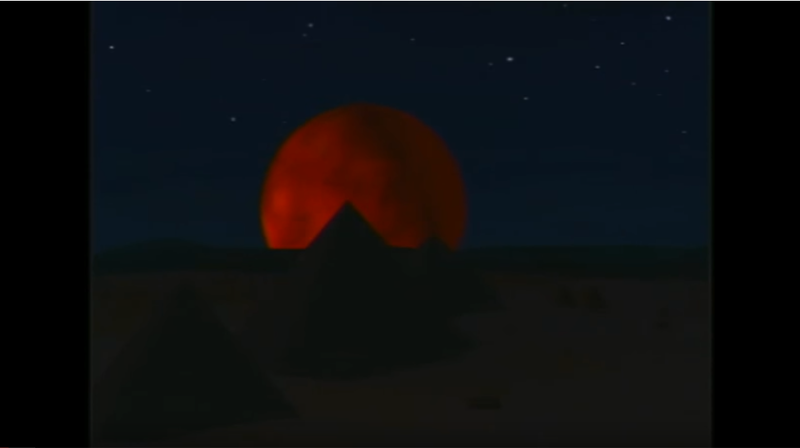 What we see in the stepped pyramids and terraced canyons is the result of two types of charge transport in a solid state matter. One is drift ionization caused by the external electric field of the storm, and the other is diffusion current caused by differences in charge density within the material of the dome. 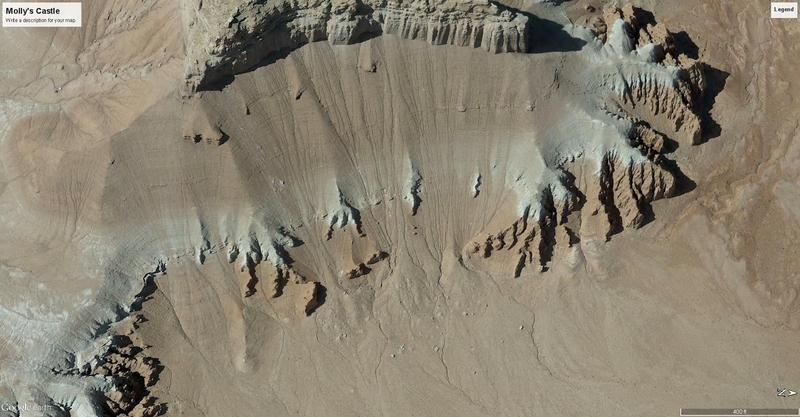 Drift current is the flow of charge created by the external electric field of the storm, which primarily drives the ionized region downward, vertically through the layers of sandstone. Drift currents obey Ohm’s Law. Diffusion current obeys Fick’s Law, which is related to Ohm’s Law but accounts for variations in charge density that causes ionization to migrate from a region of high charge concentration to a region of low concentration. No external electric field is needed for diffusion current because the difference in charge concentrations creates a gradient between regions that results in a local electric field. 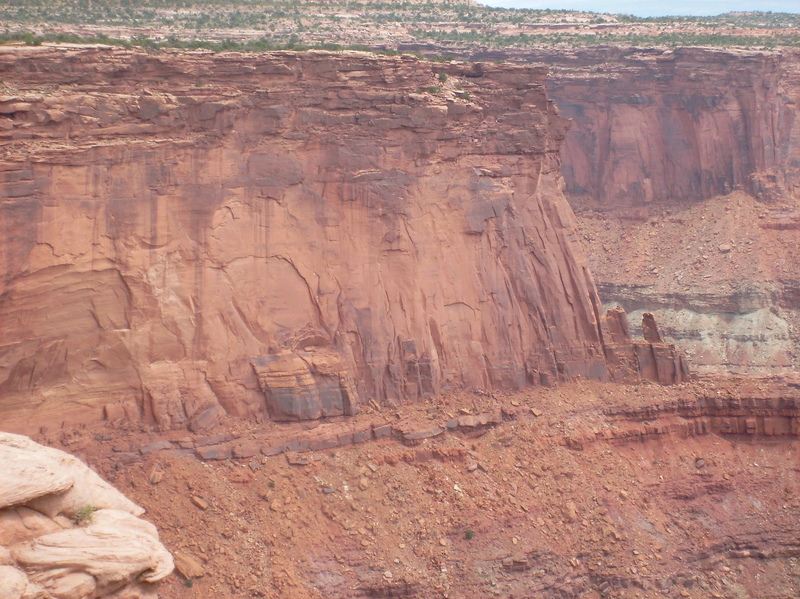 This is the primary process that migrates charge horizontally — spreading out through each layer of sandstone. What is carved away by sputtering leaves distinct scalloped edges in very dry, low conductivity material? The scalloping is a fractal phenomenon of electrical diffusion that repeats the scallop shape in ever larger scallops. 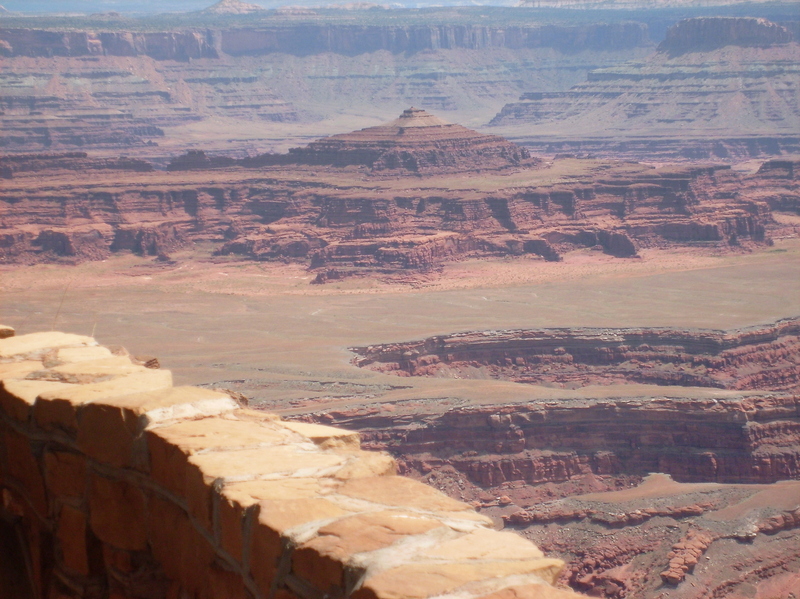 Canyon rims are dry, course, and broken, with scalloped walls. 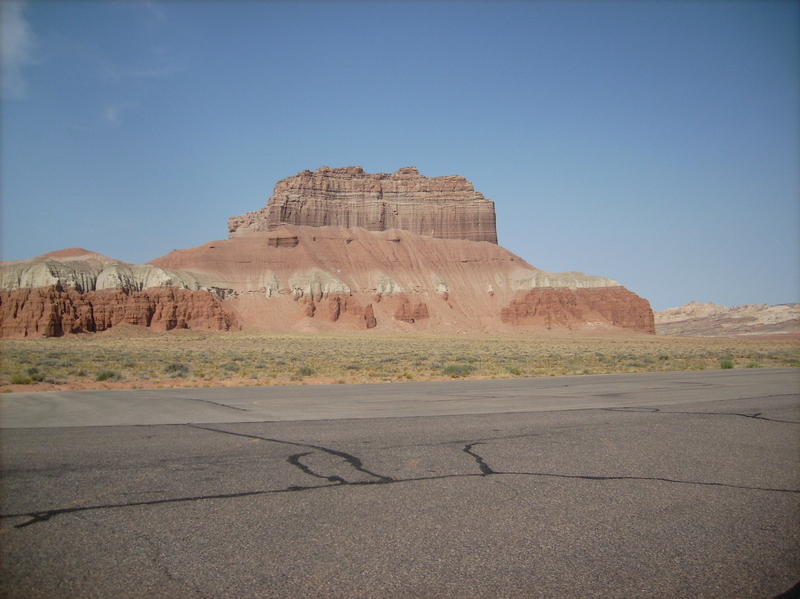 There is very little fallen, broken rock surrounding buttes and pinnacles. In wetter environments, this isn’t as apparent, or it may be totally absent, because water diffuses charge more evenly, creating smoother surfaces. 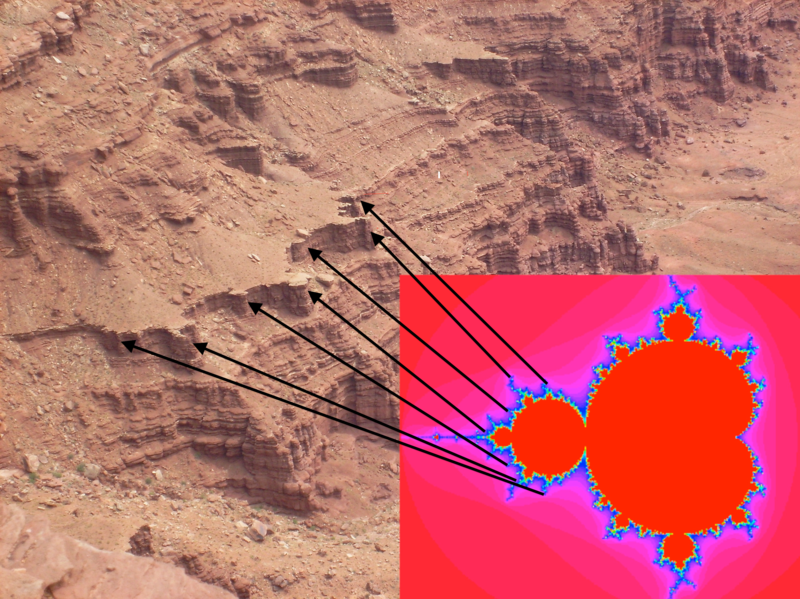 Compelling evidence the scalloped and terraced walls are a result of charge diffusion is shown in this image, where the archetype of all fractal shapes emerges — the Mandelbrot Set. Although it’s not a computer perfect rendition of the Mandelbrot Set, it is nearly so. It’s a naturally generated fractal based on the same mathematical relationships of iterating three-dimensional motion that governs electrical charge diffusion in solid-state electronics. The implication is obvious. 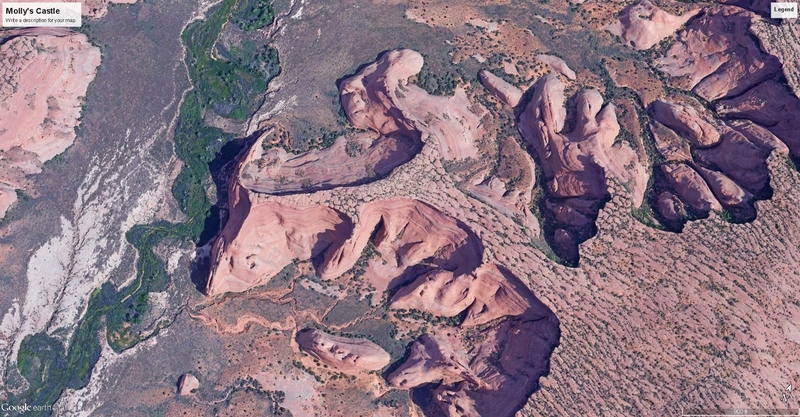 The shape of the canyon walls, the terracing, the fractal repetition of form — everything known about applied physics dictates that this is the result of electrical current diffusion on a continent-scale semiconductor under the influence of a gigantic electric field. The physics is not only laboratory proven, it’s been used to make every semiconductor device ever manufactured. 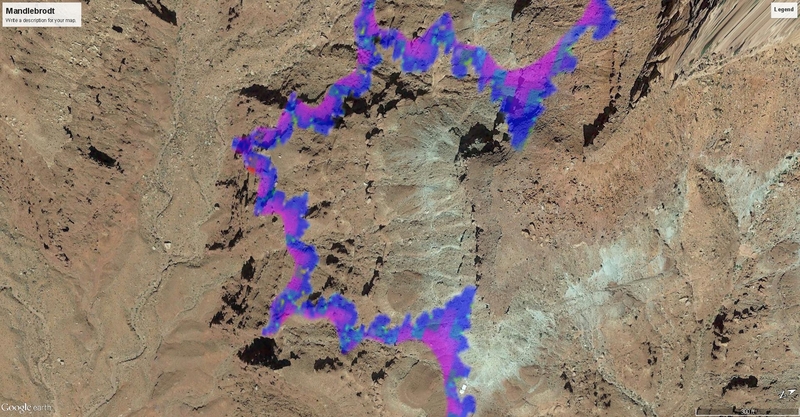 In fact, geophysicists and even Hollywood CGI artists, simulate geographic forms like watersheds and river systems, canyons and mountains, using the fractal geometry of electrical diffusion. So, what is being described here has been acknowledged by consensus science. 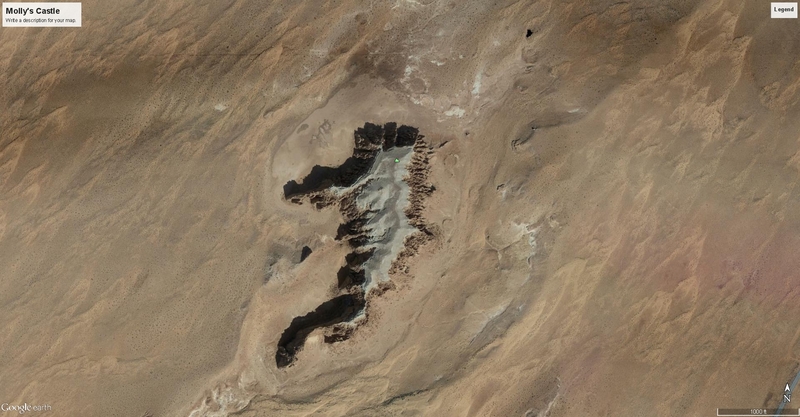 The scientific conclusion that these landforms are the result of electrical diffusion caused by an intense electric field influencing Earth’s crust, in an event in the manner Electric Universe theorists have described since Immanuel Velikovsky is scientifically unavoidable. Yet avoid it they do — consensus science, that is. Fortunately, in the Electric Universe, we like to deal in truths. 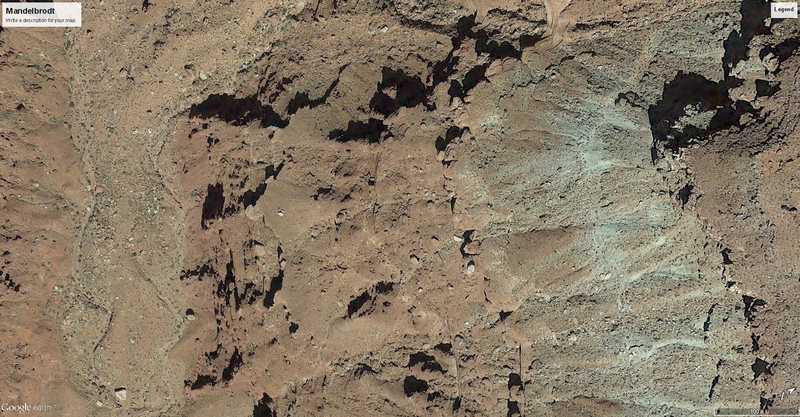 In Part 3, we’ll examine a few more examples of Sputtering Canyon evidence. 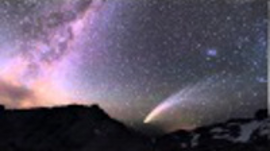 Disclosure: The proposed theories are the sole ideas of the author, as a result of observation, experience in shock and hydrodynamic effects, and deductive reasoning. 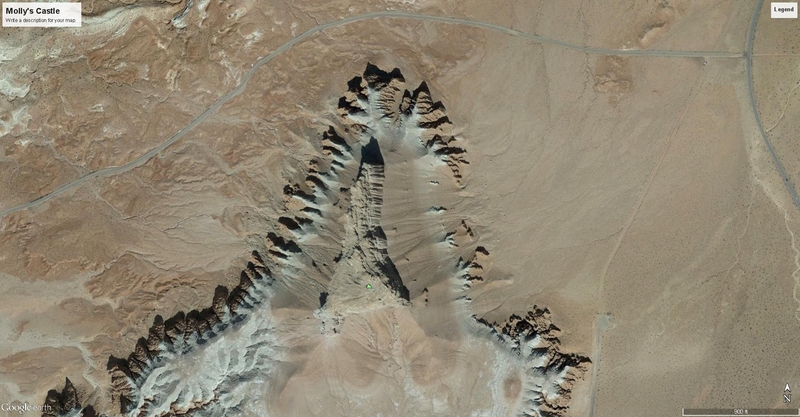 The author makes no claims that this method is the only way mountains or other geological features are created.